Written by LindseyReilly. June 18, 2014. Have you ever wished you could make slightly better choices, but lack the self discipline to do so? Or maybe you lack the creativity to devise ways in which to make these changes to your lifestyle. Matthias Laschke and Marc Hassenzahl, student and advisor at Folkwang University of Arts in Germany, use common household items to teach us how to be efficient, healthy, and environmentally conscious. Through their aesthetically pleasing designs, they remind us to use less water, use our bicycle instead of the car, keep our desks organized, and more. 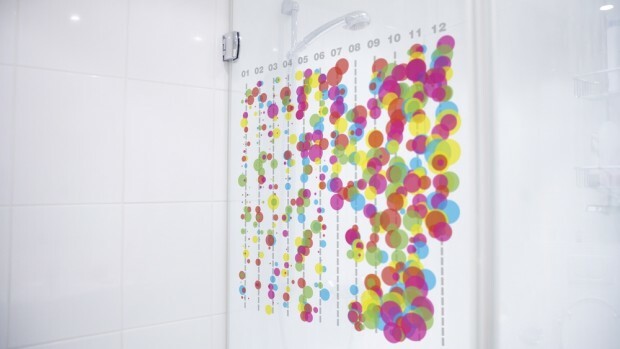 The above picture shows a shower curtain that charts water usage throughout the year. In this example, the homeowner is using less water by the end of the year. The curtain is set to know the average amount of water a person uses daily. At the beginning of the shower, the circle is at its largest. As water is used, the circle shrinks, letting you know how much of the average amount you are using. The goal is to learn to take quicker showers, saving money and the environment. To see more of these designs, go to Matthias Laschke's website. Remember, if you need help with any home automation, Your Home Mechanics can help. Tags: 21st century home, help making better decisions, home automation, Home Contractors Cleveland, home design, how to save money, how to save water, save water, take shorter showers, use less water.